Our increasingly urban society means that rural people are becoming a minority, and we all know what that means—stereotyping, oppression, othering, and general disregard. We see it playing out politically in the way Trump’s rural base is ridiculed as “deplorable” by the coastal “elites,” and the us-vs-them scare tactics used by the National Rifle Association to keep guns as easy to buy as toothpaste. Let’s get one thing clear: There’s no such thing as real Americans. We are one nation, one people, inseparable, united by a common set of ideals. 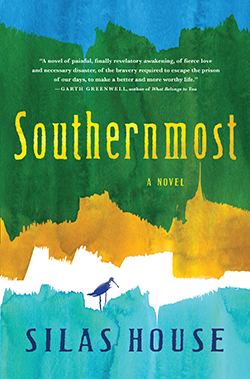 But healthy countries, like relationships, require an unflinching desire to be better, and books like Silas House’s Southernmost (Algonquin Books) have the power to make us a better country. I was thinking about how difficult it is to love someone completely when the two of you have totally different views on what it means to be a good person. If you can come up with a more spot-on observation about what’s going on in this country between rural folk and city folk, we’d like to see it. 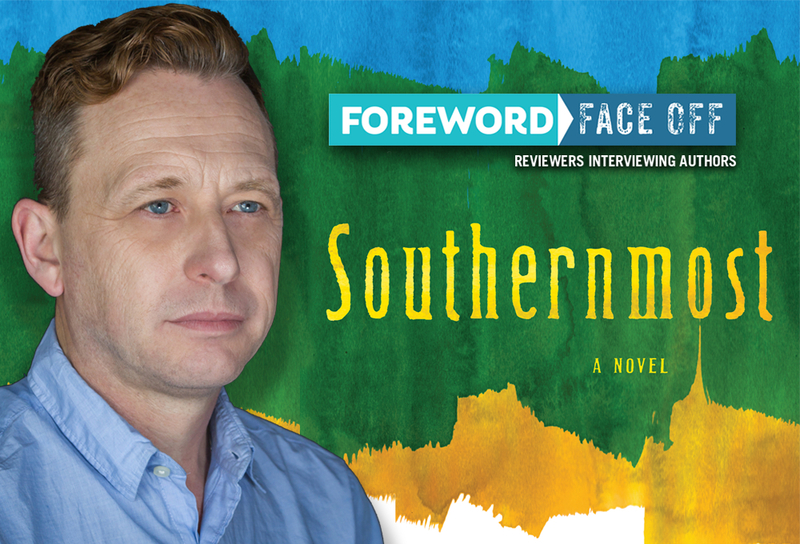 Letitia Montgomery-Rodgers gave Southernmost a starred review in the May/June issue of Foreword Reviews, and she jumped at the chance to get in his brain. As you’ll see, she was the right woman for the job. Southernmost takes place in Tennessee’s Cumberland Valley. My previous training as a linguist is about to show: I have a pet theory about certain aspects of Southern culture based on early European settlement patterns. Many hill and valley areas, like the Carolinas, were settled by Highland Scots, who brought their clan culture with them. This early cultural history might go a long way to understanding the strong “insider/outsider” dynamic, hierarchical social structures, and importance of kinship ties that seem baked into many aspects of white Southern culture, for better or for worse. I’m curious what you think of my theory since Southernmost deals directly with the rural, white Southern culture. This whole region is haunted by a sense of displacement that informs everything about our culture. It was settled by people from England, Ireland, Scotland, Africa, and other places who were all displaced by forces of religion, politics, slavery, or economics. And so, of course, being displaced led to some of the traits that we carry on today, especially clannishness (strength in numbers) and suspicion of the outsiders, influenced by not only the far past but also contemporary life, when entities from foreign countries and far-away states come in to take our natural resources and many of our best and brightest. So, yes, I think that our collective memory has a huge impact on who we are today, but I also think that the cyclical nature of economic forces and stereotypes perpetuated by the larger culture remind us that these DNA-embedded instincts (particularly sticking close to one’s clan and not trusting outsiders) are still relevant—we’ve learned from experience. Who did you imagine as your audience for this book? If “audience” is too broad a term, who did you feel you were writing this book for? But I’m also interested in how these things might be the same or different for you, too. The only audience I ever think of when I’m writing is an intelligent, open-minded reader who comes to a book desiring to be both entertained and informed and moved in some way. When I sit down to write a book, it’s usually to answer a question for myself instead of thinking of to whom it might appeal. For this book I was thinking about how difficult it is to love someone completely when the two of you have totally different views on what it means to be a good person. For example, Asher has come to believe that being a good person means being compassionate and of service. For Lydia, being a good person means letting someone know she thinks they’re going to hell so they have the chance to rectify their situation. They’re at opposite ends of the spectrum. So that’s what I wanted to explore, as I think so many of us are in similar situations in America today. So I guess what I’m saying is that I was writing for anyone with whom that might resonate although I wasn’t aware of that while writing. One of the things that impressed and fascinated me as a reader was the way your depiction nailed particular cultural norms without letting them off the hook. Not only is Asher Sharp, the main character, at a personal crossroads, the way he serves as a flashpoint and nexus for his community’s ideology suggests there’s something larger going on, as well. Why was it important for you to locate the novel in the contemporary rural South, and how did you find that balance point in your depiction? I think the South—or actually, let’s just say anywhere in rural America—is almost always seen as The Other by the rest of the country but I tend to think of it more as a mirror. People tend to always point to rural parts of America as places of homophobia, racism, and misogyny. But I think those things exist everywhere and I think some parts of the country are able to let themselves off the hook if they just assume all of that only happens in rural areas. As a gay man myself, I can tell you that I’ve definitely experienced more forceful and violent homophobia when I was in New York City and Chicago. It certainly exists in rural places, but the way I experienced prejudice there was more subtle. The thing is, it’s a global problem, not a rural one. For the most part, what I was trying to do in Southernmost was use a rural place as a stand-in for the whole country—to use it as a microcosm to say: This is a problem we have. And I was also trying to show the full spectrum of people, from the cruel fanatic who holds a gun to her gay son’s head all the way to the parent who accepts his or her child completely, and in showing that spectrum to arrive at some complexity in each character. Frankly, that is harder to do with the cruel fanatic, but in that case, I had to look at what motivated that character, and it was fear. There has been so much evolution on an issue like gay rights over the last couple of decades, and I wanted to take the reader to a working class home in a tiny rural community to show the way that evolution is happening there, too. Those are the people I know best, and I think they’re the people the media showcases the least, or the most inaccurately. Although the narrative’s mostly from Asher’s point of view, the sections in his 9-year-old son, Justin’s, voice are some of the most unique and compelling writing from a child’s perspective that I’ve read in recent memory. I was arrested by how Justin was treated with such respect—as a complete person really—whose age was an artifact of his personhood, not the defining feature. How did you develop Justin’s voice and what compelled you to give him those counterweight passages in the narrative? Well, I could have never written a character like Justin without having had two very interesting children myself. By the time I wrote Justin both of my children were away at college, but I had spent the last several years not only being their father but also studying them from the point of view of a writer. What I know best about kids is that they walk through the world with wonderfully heightened senses, and they are completely aware of everything going on around them, whether that be their parents’ marriage falling apart or what’s happening in the news. Nothing is lost on them. What made Justin so interesting to me was how empathetic he was, and, of course, that’s perfect for a novel in which the main character, Asher, is acutely aware of how so many people in his life have a terrible lack of empathy for these two gay men who have just lost their home in a flood. I think it’s a huge challenge to write a child-character, but, to me, the best writing always comes out of the most daunting challenge. I thought it was really important to have those sections that put you into Justin’s mind, but I also wanted them to be very occasional so that the novel mostly remained in Asher’s point of view. Having these little passages where we see how pure and simple this little boy’s belief system is—his idea of The Everything—makes it even more powerful when we see Asher, in his late thirties, struggling with his own ideas of belief. Asher is trying his best to do better and has a lot of obstacles in his way because of the “rules” made up by men while Justin is closer to the spiritual because he listens only to himself in matters of belief. Justin has haunted me since writing the book, probably because of that ending. I’ll stop right there so as not to ruin it for those who haven’t read it yet. I couldn’t help but see a connection between the flood that opens the book—a natural disaster—and a general anxiety or concern with “naturalness” in the various characters’ lives. There’s a generalized idea of “natural” equating to the known, the known being acceptable, and the acceptable being benign, yet the great irony is that nature’s pretty destructive throughout the book. It reshapes and resorts things with abandon. If I’m not barking up the wrong tree here, could you talk about that interplay a bit more? I love the way you’ve articulated that, and I’m so glad you saw that in the book. I think most of that comes from the biblical imagery in the book. A flood, of course, being such a huge biblical symbol. And I am also just a writer who loves to write about the natural world. Water is so important throughout this book—the flood, the river, the ocean, the big storm toward the end of the book—all of those things were very intentional, but they also fit very naturally, I think, into the action. In Tennessee, where he’s from, creeks and rivers are so important, and such a part of everyday life, but when he runs off to Key West, there is the ocean as the defining element, and it really drives home how exotic Key West is to his natural habitat. I loved always thinking about the differences between a river-based community and one situated close to the ocean. I’m never forcing weather into the book for my own benefit, but I was often thinking of how I could use the natural world in a more cinematic and effective way. When I’m writing, I am always thinking of it visually, and I love all of the weather in this book. But you’re absolutely right, this is a book that often has characters making judgements about what is natural or unnatural, and it has a lot of nature and weather. All of this sort of comes to a head when you have this faction of the community in the book actually believing that the legalization of gay marriage has led to the wrath of God in the form of this devastating flood. Many of Southernmost’s characters are patrolling themselves and each other about all kinds of identity issues, from religious beliefs to gender and sexuality to affect and presentation. Where do you see this impulse coming from, and what do you see as the cost to both individuals and communities engaged in this dynamic? Well, that’s the big theme of our time, I think: identity. Personally, I identify very strongly as a father, as a rural person, as a gay man, as a believer. Lots of people wouldn’t put those four things together. So one thing I really love doing as a writer is challenging those notions of identity, but my main goal isn’t to upend stereotypes so much as it is to create complex characters. Because I think most people are really complex, and I think more novel characters need to be. Without giving away too much, there’s a final recompense in Southernmost that surprised and delighted me in the way contrition, restitution, and hope could be conjoined with consequence and loss. Even in exceptional circumstances, you didn’t allow Asher any personal exceptions in terms of his accountability. Why was that important to you? More than anything this is a novel about being the parent of a child and being the child of a parent, and all of us can relate to one of those things, if not both. And we all know how much accountability is a part of that, especially in being a parent. One of the major parts of being a parent is realizing that you have absolutely no control, that you cannot protect your child from everything. I don’t know any parent who thinks they’ve done everything right. In Asher’s case, he makes a really big mistake that puts his future in jeopardy, but he does it because he loves his child and he can’t stand the thoughts of not being with him. But he knows right away that kidnapping his son will have consequences, and honestly, I don’t like it when a book or a film ends without accountability coming into play. I think a good piece of literary fiction must operate as an imagined and heightened world but also as one that plays by the rules of reality. I am not a fan of novels being wrapped up in neat little bows but I also think it’s important for a novel to land smoothly. I’m really happy with the way this plot plays out. There were two or three obvious things that could’ve happened at the end but I knew the right resolution immediately. I think it ends just right. Ending a novel is always the hardest part for me but this one drove me right to the finish line on a smooth road.